It’s the fashion these days to be sustainable and care for the environment. Recycling is the norm. 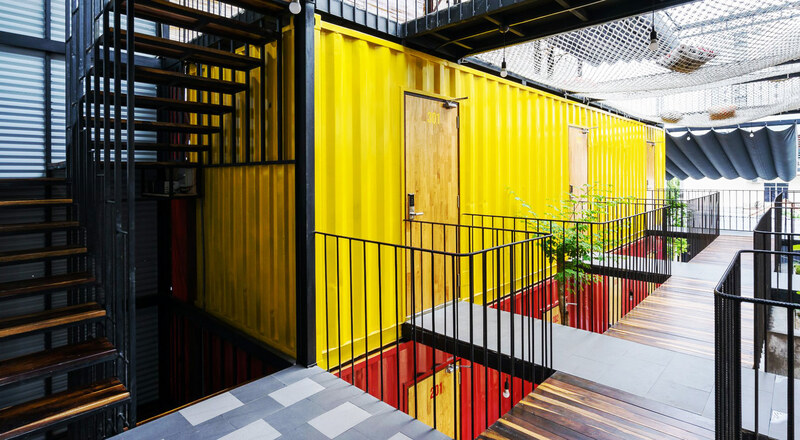 So in Vietnam they’ve recycled shipping containers, as they offer endless possibilities in the building industry. In this case, an amazing hostel has used three of these containers to make 10 rooms, private and shared, each with its own design. The inside of the hostel is very modern yet conserves the style of a Vietnamese home. The shared areas are spacious and open and the containers alternate with large hammocks with cushions suspended in the void where guests can relax and contrasting tiles. Everything makes for a very pleasant atmosphere that is full of life. Ccasa Hostel is the name of this establishment, designed by TAK architects, with the slogan ‘Everyone can join a big family’. Only a year old, it promises to mark a change in the area’s hotel and tourism industry, thanks to its very reasonable price and free breakfast. Plus, it’s only 200 metres from the beach! This is one experience you shouldn’t miss. Mark this place on the map for your next holiday.